Since the distance from Earth to Mars changes drastically as the planets orbit the Sun, Mars' appearance changes dramaticaly. Mars is bright now, and it's getting closer and brighter still as it orbits toward its 2018 opposition and closest approach to Earth in late July. 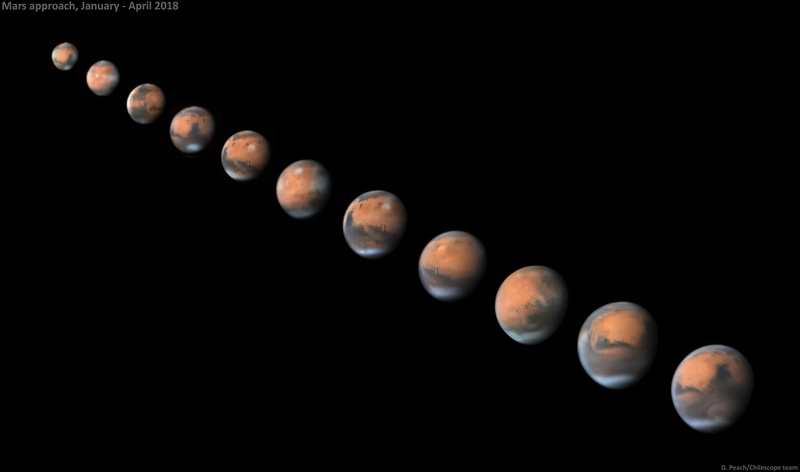 This sequence of sharp telescopic images records the Red Planet's steady increase in apparent size for the months of January (top left) through April. During that time its distance from Earth went from 284 million kilometers in January to 129 million kilometers in April, and so its apparent size more than doubled. At closest approach Mars will be about 58 million kilometers distant, more than doubling in apparent size compared to the disk at the lower right. By then it will rival the brightness of Jupiter in planet Earth's night sky, but don't believe the claims of the inevitable internet hoax.